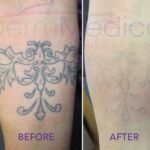 tattoo removal without the proper training or equipment. This is a dangerous trend, because the skin is the innocent bystander between tattoos and poor technique. Customers of a St. Eustache tattoo removal parlour recently learned the danger of dodgy treatments, as reported by CBC News. 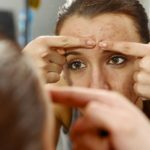 More than a dozen patients are reporting large and permanent scars after receiving some sort of chemical skin treatment by a non-physician spa owner. It seems the treatment is intended to burn or damage the skin in the hopes of removing the tattoo in question. This is not a recognized way to remove tattoos. Every single one of the 18 patients who came forward were diagnosed with second-degree burns in the areas where the treatment was applied. The patients have been told the scarring will be permanent. The link above contains pictures of the effects of the procedure, but be warned that they are very unpleasant. Many of the unfortunate patients are also reporting that they were promised very early that there was no risk of scarring or damage. That may have been why they were willing to take a risk with an unfamiliar treatment. The clinic claims they did nothing wrong, and are responding by changing their advertising. Unfortunately this clinic is allowed to continue operating with no restrictions even though they have permanently scarred people with little to no concern it seems. As a non-physician, there are no standards in place for these kind of people about what they are allowed to do, so it’s buyer beware. Stories like this should remind us that it’s important to vet your procedures, doctors and clinics and spas thoroughly before you elect for any treatments. Just because a treatment is available does not mean it’s effective, or even safe. Even safe and effective treatments can be dangerous when applied by someone without appropriate medical training. As Quebec College of Physicians President Dr. Charles Bernard notes in the link, the best way to protect yourself is to stick to accredited medical professionals. Choose licensed physicians to apply any serious treatment, and even better, choose ones who have a long experience with the treatment and who know enough about the treatments to answer all your questions in detail.